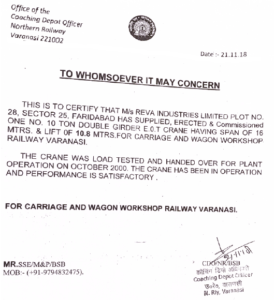 Performance Certificate Coaching Depot, Northern Railway, Varanasi. Supplied, Erected and Commissioned 10T DG EOT Crane, Span 16Mtrs. and Lift 10.8 Mtrs.